Trypraying is for people who aren't religious and don't do church. It contains stories of answered prayer, ideas of things to do, important themes about how to connect with god and honest prayers. It is an outrageous exposure to the grace and power of God. It's an invitation to start a conversation with God over seven days. You focus on a Big Issue - a problem you are wrestling with and want help with - and see what happens. There is a place to write your Big Issue - and somewhere to make notes as you go through the week. A place where some common questions are answered, and some bright ideas that might help you to try praying. At the end of the 7 days you have the opportunity to go further and pray some more. There are also some contact links to other helpful sites. 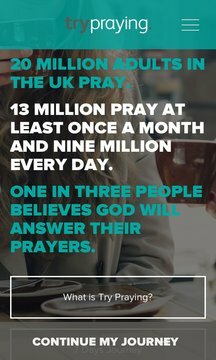 You can also contact us at trypraying for help.